Right on Pearmain off 98 Ave.
At end of Pearmain right on Moorpark St.
Colorado white, gray, and pink 0.99/lb. Montana green (light to dark) 1.19/lb. California Inyo white - fine grained 0.79/lb. 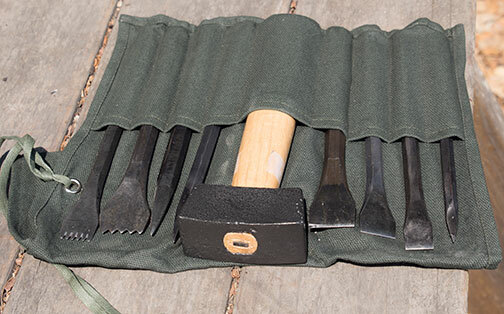 We have a selection of carving hammers (iron and steel), chisels, files, rasps, and rifflers from Italy, USA, Germany and China. Type B is designed to run very smoothly at all power levels. In fact, they guarantee this tool to run with as little as 10 psi air pressure ! Pneumatic Steel and Carbide Chisels - We have a selection of points, tooth/claws, flats with 1/2" shanks for the standard air hammers or 1/4" shanks for detail work using Cuturi type E air hammer or the 1/4 to 1/2 " adapter used with your 1/2" shank air hammer. Note:Aluminum Oxide is usually not used on stone, but the white soft bond AO hand rubs work well on marble. Selection of Burrs, Cut off wheels, Hand stones, etc. Pearl - Many types and sizes available. Availability of items are subject to items on hand.